New Utah Gardener: Top Seven Herbs To Grow In Utah - Herb Gardening For Beginners! Top Seven Herbs To Grow In Utah - Herb Gardening For Beginners! June is a great time to start an herb garden. If you are a beginner gardener and you feel a little overwhelmed by all of the possibilities, herb gardening is a great place to start. And, if you like to cook, you need an herb garden. There are many herbs that will grow well in Utah - here is a list of seven of the easiest and most useful. They are available as small plants at your local independent garden centers. You can use these herbs in your kitchen this summer and throughout the year if you dry them! Herb plants are beautiful; incorporate them into your perennial beds. They produce flowers that create food for bees, butterflies and other pollinators. Basil - Ocimum basillicum: Basil has been cultivated for over 5000 years. It's possible that it originated in India but it has become a major component of the cuisines of Southern Europe and Southeast Asia. There are many flavors and varieties. I like to grow some Thai basil for Asian dishes and lots of Italian (Genovese sweet basil) for pesto, tomato sauce and eggplant parmesan. Experiment with several varieties to see what you like. Basil gets 1 to 2 feet tall and wide. TWO THINGS to remember about basil. No, THREE THINGS. 1. Basil is an tender annual so you need to plant it every year. It will not survive frost. You can buy plants or grow it from seed. 2. Snails and slugs love basil. Keep them away. 3. Snip off the flower buds of basil. Don't let it flower. Basil goes bitter when it flowers. Mint - Mentha: Mint is a versatile herb! It is used in marinades, desserts, Indian dishes, Greek dishes, sauces for lamb and as a flavoring for iced tea. A sprig of mint in an icy gin and tonic on a warm evening is awesome. There are many varieties of mint available at the nurseries. If you want to grow a few different mints to see which ones you like best, plant them in pots and taste test them all summer. If you grow mint in the ground - !!Caution!! Mint plants are perennial and they will spread aggressively under ground. This is why it's best to grow mint in large pots. Chives - Allium shoenoprasum: Chives are members of the edible Allium genus like garlic, onion, shallot, leeks and scallions. 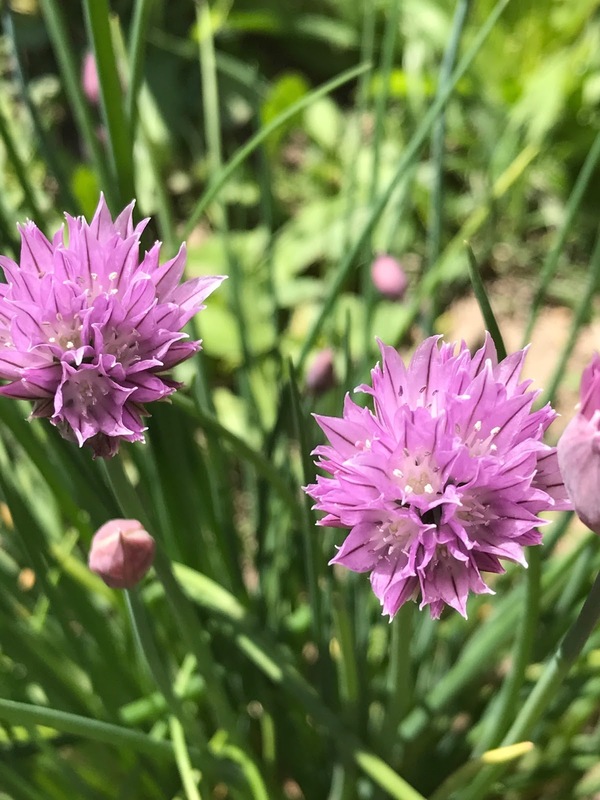 Perennial and easy to grow, chive flowers are lovely and they will bloom all summer with deadheading. They grow in clumps reaching about 10 or 12 inches tall and the purple flowers make wonderful garnish for food or additions to floral arrangements. The green chive leaves are delicious on potatoes, soups and salads of all kinds. Chopped chives garnish deviled eggs perfectly. chives grow well in Utah! Rosemary - Rosmarinus officinalis: Rosemary is a Mediterranean herb. It's cold hardiness is borderline in Utah. However, there is one variety called "arp" that will survive here. If it is planted in a sunny spot and given some mulch in the fall, chances are excellent that you will have rosemary year after year. It can get quite large (2 - 3 feet tall and wide), so plant it where it has room to grow. Rosemary is great in marinades for grilling pork, chicken or beef. It also goes into the Thanksgiving turkey stuffing. It can be easily dried and used all year. Thyme - Thymus vulgaris: The Ancient Egyptians used thyme for embalming and many cultures through the centuries used thyme to promote courage. I like to use thyme in soup or with chicken. There are lots of varieties of thyme - some creeping and some with different colors and flavors. For cooking, I like just the plain English Thyme. It's low-growing (6 or 8 inches tall and 10 or 12 inches wide). It is perennial but it sort of wears out after a few years so you might need to replace it. Parsley - Petroselinum crispum: Parsley is native to the Mediterranean region. It is a biennial which means that it lives for two growing seasons. The first year, parsley grows only foliage. The second year, parsley grows some foliage and some tall thick stems that produce flowers and seeds. Then the plant will die. So they need to be replaced. I like to plant one or two every year so there are always some plants at each stage of their life cycle. Try the curly parsley and the Italian flat-leaf parsley. Great for garnish, salad, soups, most Italian dishes and juicing. Sage - Salvia officinalis: This handsome mediterranean herb is a perennial and will survive our cold Utah winters. It gets large (2 - 3 feet tall and wide! ), but you can trim it back all summer long. Just don't trim it in the fall. Use fresh in soups and stews or cut and dry the leaves to use in your Thanksgiving stuffing. This plant loves sun and heat. Great for the water wise perennial bed. Heaven's! These flowers are so stunning and beautiful,I have never seen such shrubs ever and i also didn't know about these flowers.They look so refreshing. I would be glad to know that if there is any health benefits of these shrubs?